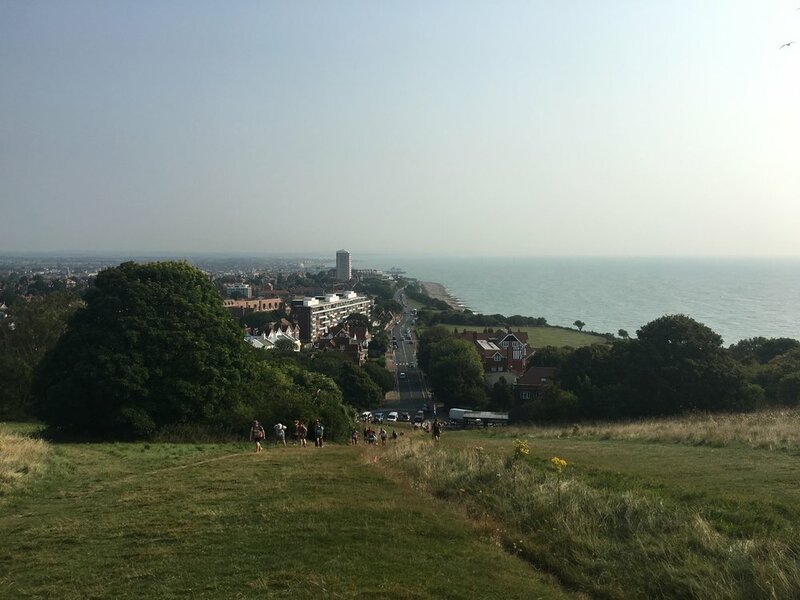 Then walking along the South Downs, I could see Newhaven to one side, and River Ouse / Lewes on the other side, the weird thing about being high up, you can see so far away, and you think it can't be too far away but much further than you think. See the Ouse, remembering my training walk from Lewes to Newhaven, but took ages to get there on this walk. 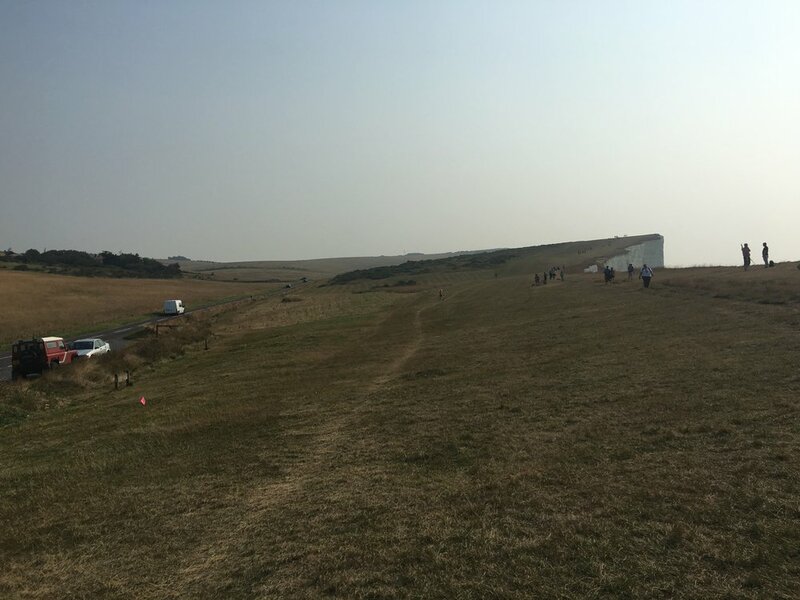 Still nice weather, not as hot as the morning sun at Beachy Head, and have a bit of a breeze helped. This part of the South Downs walk I was helped along the way by Moore, Roger Moore. Listening to his autobiography My Word is My Bond was a nice way to relax and enjoy the scenery. Felt this was a hard part for me, just done over 50km, and was tired. Hove Park seemed to be moving further and further away, so was glad I could sit down, have some pasta. Check on my feet, change into dry clothes where Claire brought with her. As it was now dark, we had to wait until groups were ready to go out every 15 minutes. So with glow sticks, head torches on I set off to go back onto the South Downs. The section from Hove Park to the next rest stop Botolphs a 14km leg was the hardest of the lot for me. I think it was a combination of tiredness, the dark, needing the toilet only a few K's after the rest stop, being both hot and cold, the floor surface which is probably okay when you can see where you going, but in dark you can't see where to put your foot. I was hoping to see amazing night sky but as it was quite cloudy, you didn't get the views I hoped for, but was still amazing. Sorry the above photo was a bit blurred as camera was a bit smeared, but I think it gives it a bit of atmosphere. Was great seeing the dawn break. Bacon Rolls at one of the next stops was a welcome addition. Every time we saw a KM marker we counted down distance to either the next rest stop or to the finish. Once we did the last rest stop it was amazing, knowing we were getting closer and closer to the finish. Sometime during the night I knew my plan for doing the walk in around 20 hours wasn't going to happen, but towards the end knowing this was going to take me over 24 hours made it felt more worthwhile. Knowing I have walked for a day sounded very cool to me. So would I ever do this again? No, though doesn't mean I wouldn't do another challenge. I thought Action Challenge did a great job, the route was marked out and all the rest stops were well stocked with snacks and drinks. They did a great job, so the reason I wouldn't do this is the route, having done it once I am not sure how much would a challenge it be. So glad I have done this, it is one of the biggest achievements I have done. I also like training, and the routine of training. I can use my organiser to work out what I have to do when (I use Wunderlist) & also my spreadsheets charting how far I have walked, how many mins I have spent on rower or what weights lifting in gym. I have been doing my weekly training blogs, and have no idea if anyone reads them (or even reading this) but it helps me feel better. Want to thank everyone who sponsored me. I have found the fundraising harder than I thought. Back in 2007 & 2008 when I was doing London Marathon found it easier. I think it is the fact more people are doing charity events nowadays & it is hard to support everything. I started running in 2006, to loose weight but it was the mental health benefits which carried me on. The feeling after a good run, and I get that after a good walk now. I'm looking forward to the feeling of finishing, the feeling of walking at night with just headtorches & moonlight to guide us. Want to say a massive thank you to Claire, who I couldn't have done this without her support. She is amazing & love her so much. The race is near, so near in fact in a weeks time it is all over. Buy a raffle ticket and help support Sussex based charity Rise. I am walking 100km to help fundraise for them. Fri 29th - Rest & Party night. Did a 7hrs 15 mins walk from Brighton to Lewes and back, first from Woodingdean to Lewes then back via South Downs. Covering 24.24 miles. Again my GPS watch lasts 6 and half hours. Enjoy the long walks, the being alone listening to podcasts while walking in the countryside. Amazing stuff I learn, and also the laughter of the comedy helps pass the time. 10 mins on 5 weight machines, doing 2 mins on each. Aiming to do more reps than previously, which I achieved on 3 of the 5. So overall happy with training so far, especially as still getting over the chesty cough I have been having for the last two weeks. Can you help me with my charity night, got any contacts or advice to share. Instead of a rest day went for a walk with Claire from Brighton Marina to Rottingdean and back again via a cafe at Rottingdean Total 5.05 miles. 7 machines working on my upper body, calf & hip muscles. Did 1 Hour on the indoor bike at home, little machine, so I can sit on a chair, watch TV and cycle at same time. 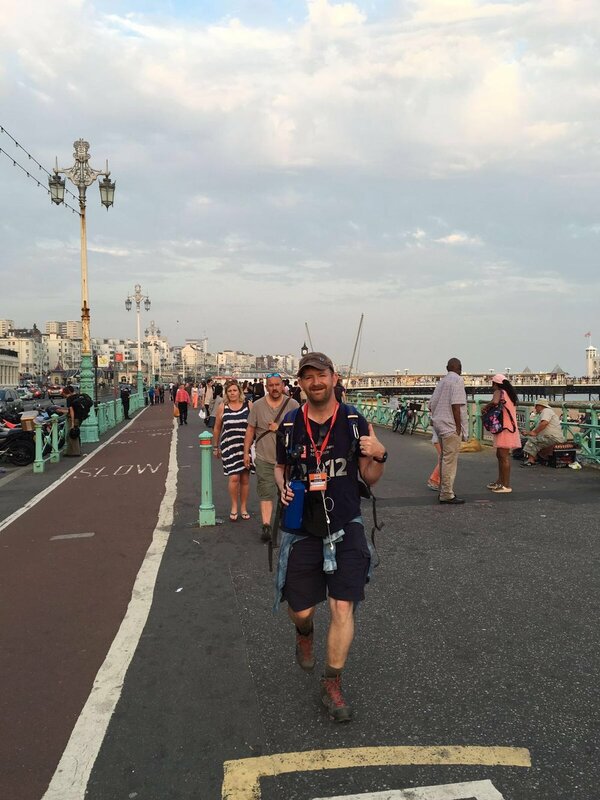 Walk from Hassocks to Brighton, covering 10 miles in 3 hours 2 mins. Really enjoyable walk through the Sussex countryside, though the climb up to Jack & Jill shows me I need more hill work. Nice walk along Devils Dyke with Claire, in total covering 4.41 miles and 1 hour 40 mins. Nice sunny weather, and of course we had ice cream up there. 93 Days to Go & aim focuses on this challenge. One of my motivations is recovering from all the injuries & illness I had over the years. The surgies of the last two years has pushed my fitness back to zero. Well I say zero, the lung capacity went back to zero but my legs still had some sort of muscle memory, even though I hadn't run for quite a few months. So it was always a challenge as legs wanted to go faster than the lungs! My biggest running injury has to be when I got a stress fracture in my leg while running the Nice to Cannes Marathon in 2009, not that we knew it was fractured at the time. I was running with a friend, Michelle & we both thought I must have pulled a muscle in my knee and tied to stretch it out. This happened at mile 13 & thought at first I can run it off, but it got worse & worse until by the very end I was running on one leg. I was run / walk / run (using telegraph poles or other markers to work out how far I could run before stopping). It was only when I got back home from France, and my physio saying they didn't think it was muscle damage that I got an X-Ray to discover the stress fracture. 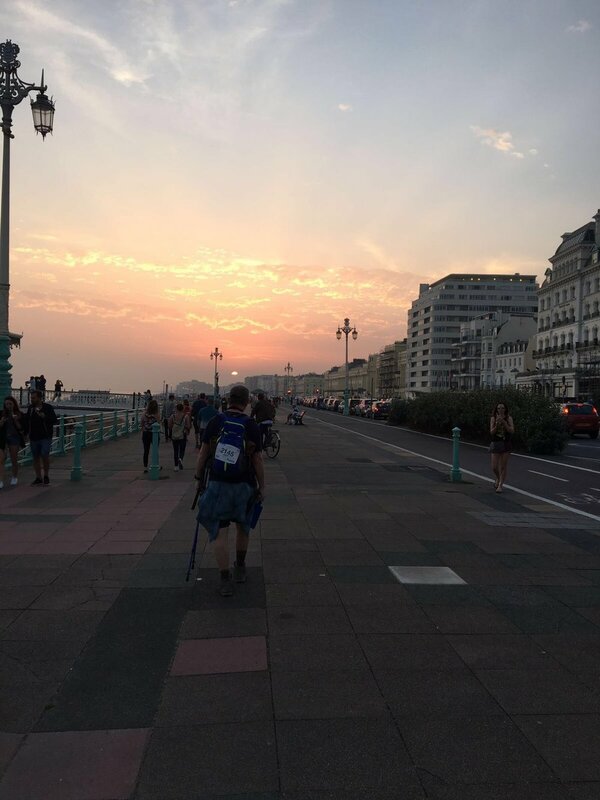 Luckily having done the Moonwalk, 26 mile walk through London at night, and the night version of the London to Brighton Bike Ride has given me good idea of how my body reacts to this. So feel confident with a few practice night time walks this won't be a problem. Here is the results of my Week 1 training plan, my first official week even though had been going to the gym for the last few months, as well as doing the 5k Heroes Run last weekend. Will update next Sunday, how Week 2 has gone. Will be posting on Sunday how my training week goes. So now thinking of fundraising ideas, and have a few in mind. But if anyone has any suggestions please let me know. 2. Offer people twitter / social media / business advice in exchange for charity donation. 4. Asking People very nicely!